Our Mobile Phones are equipped with a lot of personal information that we don’t like to share with most people or say we don’t want it to get public. Our phones are our secret keepers! There are things which are personal, private and even confidential. We cannot afford to lose such information nor can afford it to get leaked! 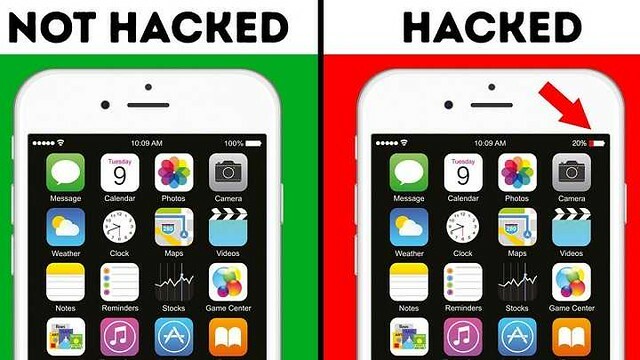 There is no phone that cannot be hacked! If technology advances why not hacking techniques? So here we are with a guide to tell you how phones can be hacked, how to know that your phone is hacked and of course the most important one how to protect your phone from getting hacked. But, let me guess. You are thinking that hacking a phone is a tedious task and your phone is probably safe as no one would go into trouble to hack it. Change your mind and scroll down! How do I know my Phone is hacked or not? Well, if a phone is hacked, the phone gives you certain signals. If any of the following is observed in your Phone, your phone is most probably hacked. If your battery drains out quickly and there is no fault in your battery, your phone must be hacked as an unknown application keeps on running and drains all the battery. This is the very reason of your phone getting warm. If your phone tends to reboot itself then it is either a technical fault or hacking. If your phone, by its own, gets switched off, turns on certain applications or starts calling on its own it is hacked! Your phone has certain unknown numbers dialed up in your recent calls list. If you hear echoes, noise or voices during calls, you need to get alarmed! Your phone gets warm even when you don’t make a call or work with it. This is another sign that there is an unknown app running. There are noises or echo during calls, and you haven’t had them in this location before. It means your call is being heard somewhere without your knowledge. How do phones get hacked? 1-Certain applications: Applications that are meant for spying such as Spy Phone Application, Spyzie, and Spyera. 2-Public Wifi: if you are using an unprotected Wi-Fi or a public Wi-Fi you are risking your phone to get hacked. Everyone around you can sneak into your data! Public Wi-Fi that is available at airports and cafes are a great threat to your data. 3-Charging: If you are charging your phone with an unknown USB you are allowing hackers to hack your phone. USBs available in cars and airports that are not very safe for your phone as they can allow your data to transfer without your consent. 4-SMS: Certain SMS that say that the link has information on your bank statement, photographs or the money transfers receipt are actually a way to hack your phone. Do not open such SMS and download the files believing it be your personal data. 5- Signaling System SS7: Unfortunately, such a signaling station is being used around the world by the telecom sector. Such a system allows easy access to hackers into your calls, locations, and messages. Never open a link whose URL is incomplete. Chose the option of only charging while charging your phone with unknown USB. Abandon the Remember password option! Chose manual Wi-Fi selection instead of Automatic. Android users shall install anti-virus software. Keep your phone secured with a password. Never purchase online via public Wi-Fi.